How do you know when a real estate market is getting soft? Property values have not been declining lately, but how would you know if they were possibly going to decline? What metrics should you watch to be able to know if a real estate market is softening? Have a look below and let me know what you think. Anything else you would add? Since the temperature of a real estate market often evolves over a period of time rather than an instant, it’s important to be able to look to the right metrics to help us interpret what the market is doing. Once we compare the metrics above along with sales and listings, we can get an idea of how the market is moving. Of course other metrics such as interest rates, cash investors and lending standards can definitely impact values too. As I always say, real estate is like a multi-layered cake because there are many layers to the market. A Rumor About Appraisers & Listings: There is a rumor in the real estate community that appraisers cannot use listings to adjust for how the market has moved (whether up or down). This is definitely NOT true. Appraisers can make adjustments in reports based on listings. As we all know, today’s sales reflect the market from say 30-60 days ago when the sales got into contract, whereas reasonably-priced listings represent what the market is doing right now. Therefore if listings are priced higher, appraisers can make an upward Date of Sale adjustment to sales to reflect however listings are priced. Or if all listings are priced lower, appraisers can make a downward Date of Sale adjustment to sales to compensate for the market cooling off or declining. 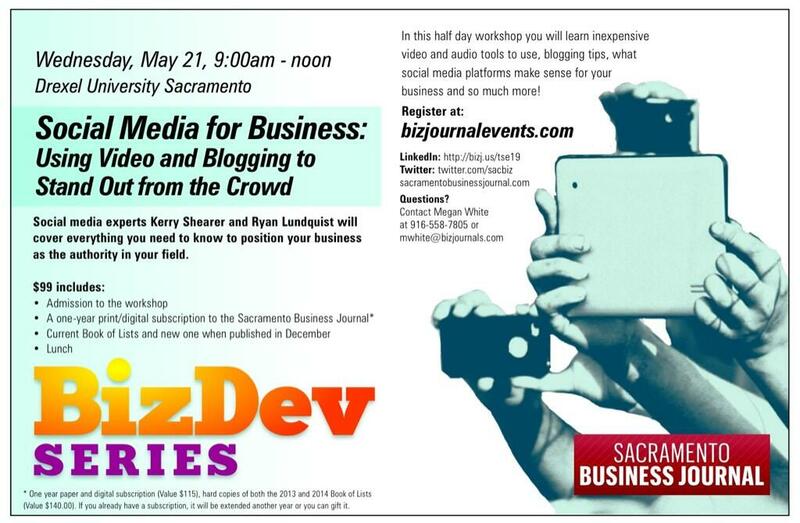 Class I’m teaching for the Sacramento Business Journal: On May 21 I am co-teaching a class on blogging and using video for business for the Sacramento Business Journal. I know this is late notice, but I’d love to see you out at Drexel University tomorrow. The cost is $99, but that comes with a subscription to the SacBiz Journal, so the class pays for itself. Click the thumbnail for details or see this direct link. Question: What other signs do you watch to know if the market is getting soft? Thanks for pointing out to appraisers that they can make time adjustments anytime they have reasonable justification to do so. I still hear appraisers saying things like, “The Underwriter will not accept an adjustment for this or an adjustment that is large.” If an adjustment is necessary, it is necessary. Appraisers who do lender work need to stop letting the client or third parties control the outcome. Not every property or market fits into a neat set of guidelines and checked boxes. Thanks Gary. There are so many different metrics to watch to get a pulse of the real estate market. When we know how these metrics are moving, we can better explain to clients and the general public how the market is really changing. Spring fever never arrived in the Sac house market, and that seems a change. We certainly can’t blame the weather here. The stock market is heating up, and that seems to indicate that increasing numbers of investors prefer that gamble over property. If you look at the real estate market in Britain ( which mirrors our economic policy ) you will see a huge real estate bubble inflating. If you talk to Brits, you’ll find a dismaying disconnect between what major news outlets report ( say Skynews ) and what the well informed person on the street is saying. Closer to home, I think relocating the Kings to try to jumpstart downtown seems like a ‘Hail Mary’ play. We’re giving up city jobs with benefits and pensions to create private jobs at minimum wage. And in a larger sense, we’re not creating an industry that generates money from outside sources. Rather, most of the Kings’ patrons come from Sacramento, hence they draw no significant new capital, merely re-circulated local money. Is this stagnant market the quiet before yet another storm or just a ‘new normal’? Thanks Ricardo. I always appreciate your take, and I know you always have one too. 🙂 I would say Spring fever is here since we have seen a modest uptick in price level in many areas, but most of all the number of listings and pendings has increased since January. Moreover, days on market has decreased slightly, which is fairly normal for the seasonal market. It has been a bit of a funky market though – that’s for sure. That is the million dollar question. What is to come? We shall see. What we can do now is watch these metrics very closely. Another stat I watch is movement in the media sale to list price ratio (S/L). That number too, particularly in combination with others on your chart, can be more proof of market movement. As to ‘time’ adjustments, I prefer to use the term ‘market condition’ adjustment. The simple passage of time does not denote a change in prices, market conditions do. Thanks Butch. I agree with you about sales to list price ratio. I wish I had included that in more definitive language. That is in part what I was attempting to communicate when discussing listings being priced lower, but I definitely wish I had honed my language to discuss SP/LP more clearly. The ratio in my area has decreased by 2% recently. Well said on “market adjustments”. You are correct that time does not necessarily denote change. Ryan, the first thing that came to mind about signs of a softening market is when you start seeing more 3% commissions being offered to the selling agent. Edgar, what a fantastic point. Kudos to you for bringing that up. Thank you. That’s what I love about the comments. This post is already getting better because of the added insight.